The Earthquake Museum (Italian acronym "MuTerr") is located in the major hypogean spaces of the San Domenico Convent in Soriano, in the Province of Vibo Valentia (Calabria Region, in the South of Italy) ; a religious XV Century complex which was partially destroyed by the earthquake of 1783. The Convent, formerly called "Casa Santa", has been the focus of the '' Dominican Universe ", having had the important support of many popes, cardinals and kings of Spain and Naples. Since 1654, the "Holy House" has administered the County of Soriano and therefore its sphere of economic influence, culture and society has greatly contributed to the development of the surrounding areas and settlements. Internally there were a guest house, a pharmacy, a printing house and a well-stocked library, which still exists and that contains many prestigious volumes. 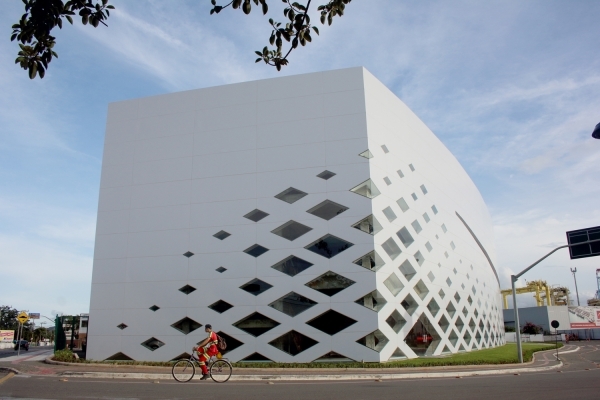 For many years, the Dominican complex has been one of the most important symbols of the earthquake history and today it is reborn as a museum center, second only to that of Reggio Calabria. The complex also includes the Museum of Marbles (Italian acronym "Mumar") where of particular value is the Head of Saint Catherine of Siena, in Carrara marble, probably attributed to Gian Lorenzo Bernini. Besides the "MuTerr", other three museums are under construction: those of Ceramics, Sacred Arts and an art gallery of Contemporary Art. The MuTerr represents an attractive meeting and information place on earthquakes, not only of the Calabria Region, but of the entire country. The earthquake phenomena are analysed from different perspectives: historical, anthropological and architectural. Thanks to this restoration, another important part of this complex, which remained so far "hidden" and never used, has been brought to light. All the ancient architectural spaces of the southwestern wing, commonly called the "Darks", testimony of what was once the most "deadly catastrophe" caused by the earthquake of 1783, are now accessible in the "MuTerr" and can be used for temporary exhibitions, different cultural events or conventions. The Museum has two distinct environments: the visitor is welcomed in a modern area, marked by the installation of a suspended ceiling monumental wooden ribs, created with digital processes of parametric design and cut with CNC machines. 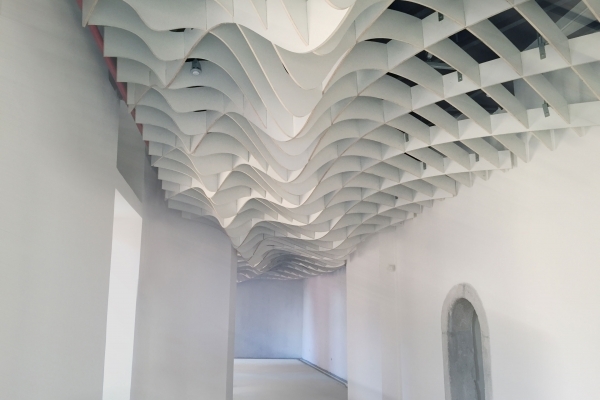 The ceiling is a true piece of art that recalls the wave and fleeting movement of the earthquake and which visually envelops the visitor in an aggressive and dynamic place. The ceiling was designed by sectioning a "seismic wave" in more than thousand pieces, snap-fit assembled by attacks and steel cables to the IPE beams which are anchored to the perimeter walls. Cutting and preparation for digital manufacturing have been created with Rhino / Grasshopper software.From this bright area, the visitor is then conducted in the "Darks", characterized instead by a charming, calmer and contemplative atmosphere. Feature of this second room are the vaulted ceilings, whose charm has made it stand out from the white resin flooring. To highlight the direction of the vaults and of the opaque glass panels covering the channeling of the installation system, the flooring continues without any gaps.The long and complex reflection on earthquakes that the "MuTerr" proposes, between history and science, looks at the past but strongly interests the future, in the belief that a new shared culture of security of tenure can grow on these bases of knowledge on the earthquake phenomena.